→How To Get Your Baby to Sleep In A Bassinet? When you are a new parent, there are many things that you worry about in the first few months of your newborn baby’s life: what to do when the baby cries, what to feed them, how often you have to feed them, and how to get them to sleep. 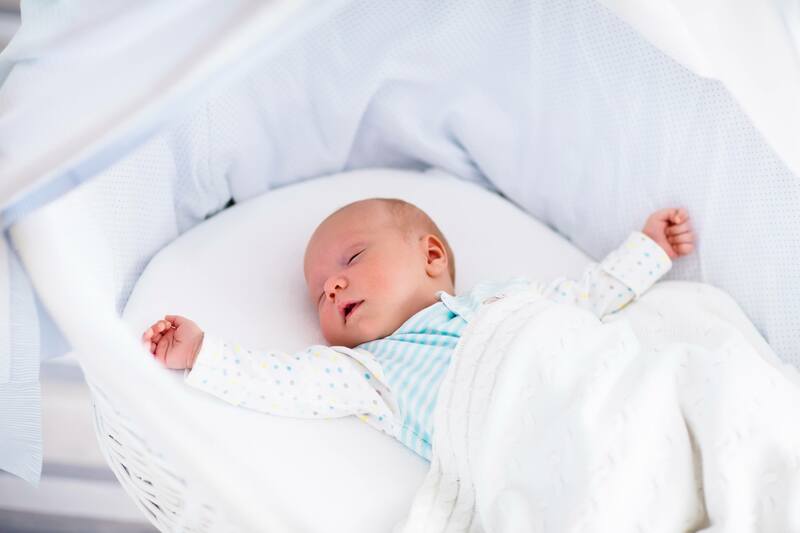 Actually, you may not have much of a problem getting them to sleep in their swing or in your arms, but you might want to think of a strategy to get them to sleep in the bassinet. A bassinet is a smaller baby bed designed with portability in mind so you can have your baby by your side anywhere you go. It’s tempting to have your baby sleep between you and your partner in bed, but it’s not safe for your little one. Placing them in their own bed ensures that they are protected from sleeping accidents. However, most parents have reported having trouble getting their baby to stay asleep once they put them in the bassinet. Fret not, because this article is all you need to put an end to that problem even before it begins. Here is how to get baby to sleep in bassinet. Swaddle to create a snug environment. Because they have just come from the womb, newborn babies like the feeling of being held. Put a padding in the bassinet or swaddle your baby so they feel like you’re holding them as they sleep. To create swaddling, take a blanket and fold it into a triangle. Place your baby in the middle and wrap the side of the blanket tightly around their body, tucking the cloth under them. Then, take the other side of the triangle, bring it to the other side of the body, and tuck it under. Avoid a completely flat surface. A firm, flat surface is best for a newborn baby, but they don’t usually like it the first time because, as mentioned, they like feeling snug. To remedy this, fold or roll a towel and put it under the mattress of the bassinet to keep your baby elevated without the use of a pillow. Create a consistent sleeping routine. A daily routine of bathing, feeding, rocking, singing a lullaby, and finally putting the baby to sleep in the bassinet will help them get used to it. They will soon associate being put in the bassinet to falling asleep, and that will make it easier for them to doze off. Get your baby used to the bassinet. Choose a time when your baby is in a happy mood and let them get comfortable in the bassinet. Do this a few times a day until your baby gets used to going to the bassinet when they are tired and ready to sleep. Put your baby in the bassinet while they’re still awake. Many parents make the mistake of putting their baby in the bassinet once they’re asleep. This shakes the baby awake and the parents will then have trouble getting them to sleep again. To avoid this, put your baby in the bassinet once they get drowsy. This will teach them that they can sleep on their own, in their own bed. Once in the bassinet, continue singing your baby a lullaby or reading them a bedtime story. Use soft, thin sheets. Babies fall and stay asleep the easiest when they are feeling cozy. Something to hold onto like a pillow, a blanket, or stuffed animal can help with this, but these things aren’t recommended as they can lead to suffocation. Soft, cozy sheets will generate the same results and make your baby feel cozy at night without risking their safety. Just make sure that the sheets are thin and will not unravel. Never ignore your baby’s cries. Since they are still very young, your baby is not yet capable of sleeping through the night on their own. You may have some transitioning to do for the first few weeks or months, so keep a close eye on them and help them get used to their new bed. Look for a bassinet manufactured after April 2014. New bassinet safety standards went into effect in April of 2014, so you can rest assured that bassinets manufactured after this date follow very strict requirements to avoid the risk of SIDS (Sudden Infant Death Syndrome). Pay attention to weight and age limits. Every bassinet has its own weight and age limit. Most bassinets can hold up to 15 to 20 pounds and may be too small and fragile for babies heavier than that. When buying a bassinet, make sure that you pay attention to the weight limit found on the label, so you know how long your child can use it. Look into the bassinet’s portability. A bassinet is supposed to be easy to transport, but make sure that the features that make portability possible will not sacrifice the safety of your child. Check the latching mechanism of its wheels, how sturdy the bassinet is when folded and unfolded, and how easy it is to assemble and disassemble. The bassinet should come with fitted sheets. A flat surface is best for babies and it’s a must that they don’t have anything in the bassinet with them that could lead to suffocation, like a pillow, a blanket, or sheets that could come loose. Know when to move your baby to a crib. Pay close attention to your baby’s age and weight. Remember that bassinets have weight and age limits and there’s a reason for that. Once your baby reaches a certain age or weight, it means that it’s time for them to sleep in something bigger. Remember, create a womb-like environment so that your baby remains comfortable in a bassinet, but never neglect their safety. Now that you know how to get baby to sleep in bassinet, you have one less thing to worry about.